For a no-nonsense approach to vacuuming, consider adding one (or more!) 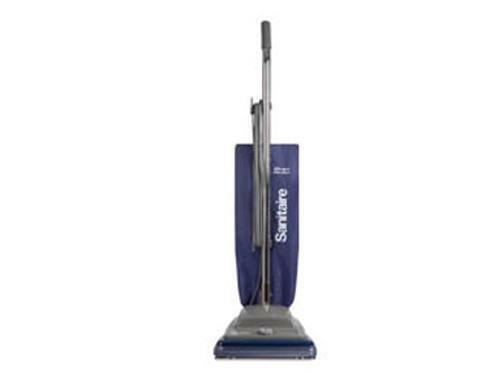 of these Sanitaire by Electrolux commercial upright vacuums to your cleaning arsenal. Our customers trust these powerful and sturdy models to clean schools, hotels, office buildings, and even their homes. For more information about any of these vacuum cleaners, check out their respective product pages, see our comprehensive comparison chart, or give us a call at (866) 972-8227. The Sanitaire by Electrolux SC679 commercial upright vacuum cleaner was designed to endure the day-to-day challenges of commercial cleaning. Its ideal for large areas with wall-to-wall carpets, and was constructed with hotels and office buildings in mind. It will also work wonders in schools, government buildings, restaurants, and even in your home. 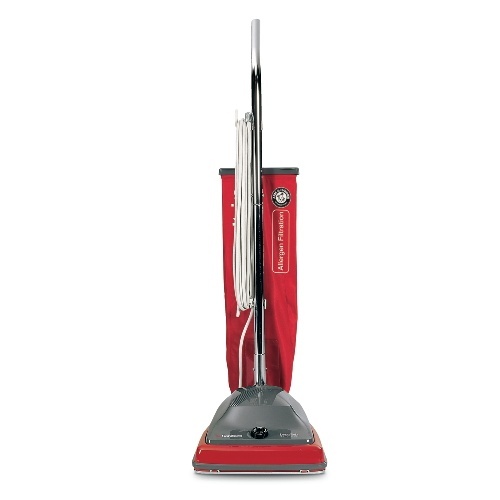 The SC679 features a 5 amp motor, 30-foot power cord, and large, 18-quart shake-out dustbag. With this model in your cleaning fleet, you will never have to spend money on dustbags or keep spare ones on hand. 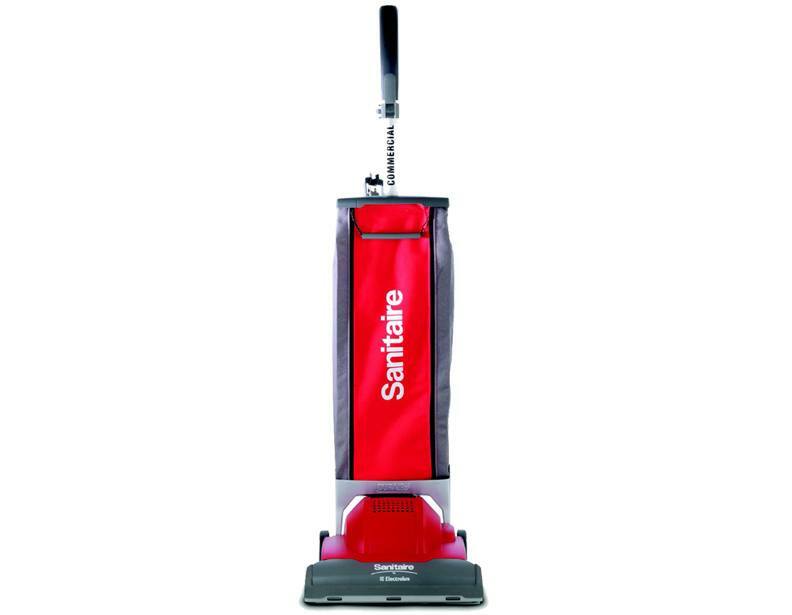 The Sanitaire by Electrolux SC689 is ideal for vacuuming hotels, office buildings, and more. It weighs only twelve pounds and offers a generous 30 foot power cord for extensive cleaning range. 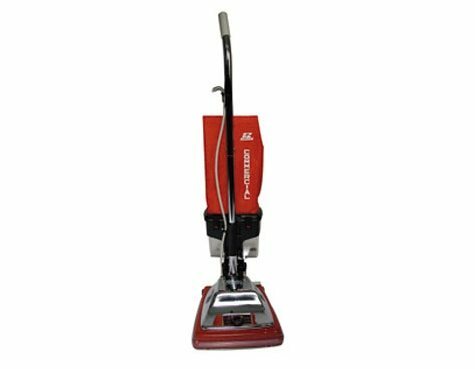 Its bagless configuration and relatively low noise output make the SC689 a highly sought-after commercial vacuum cleaner. Despite its light weight, the SC689 is sturdily built and is more than ready to tackle even the toughest commercial-grade vacuuming tasks. 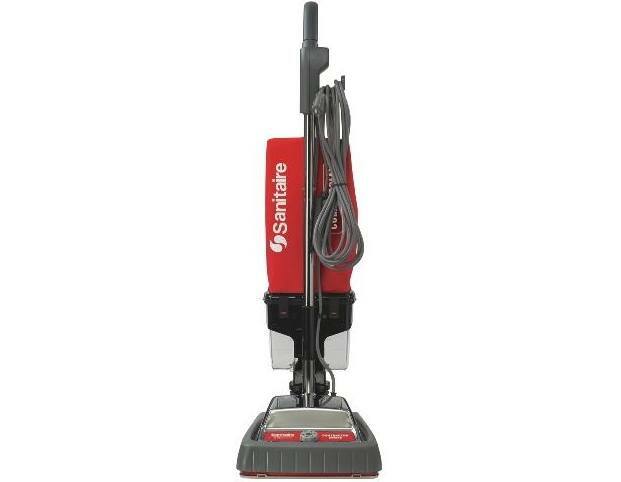 This Sanitaire by Electrolux SC684 commercial upright vacuum is the perfect blend of lightweight construction, powerful cleaning performance, and durability. 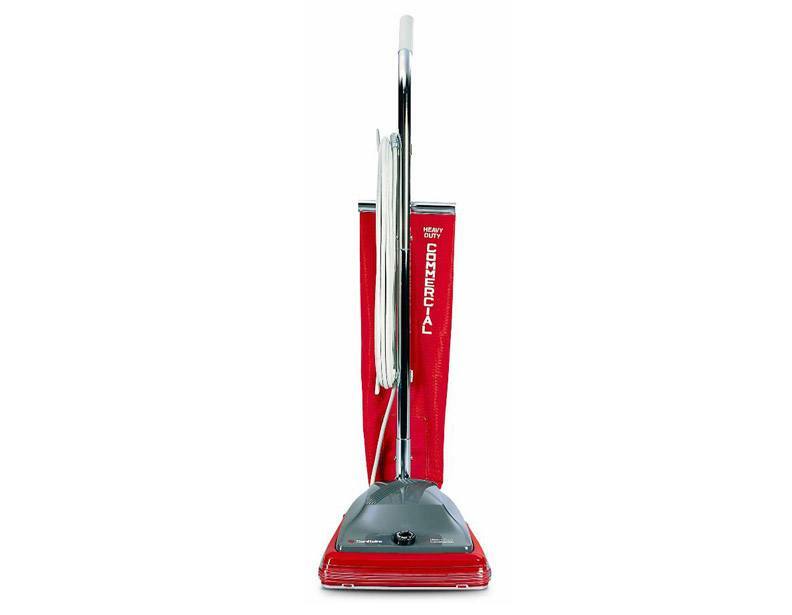 This 18 pound vacuum is constructed primarily from durable plastic, but features a metal-plated chrome hood that can stand up to even the toughest commercial cleaning jobs. In the event that the powerhead bumps into a wall or furniture, a rubber bumper guard ensures that it won't leave and scuff marks or scratches behind. The Sanitaire by Electrolux SC886 commercial upright vacuum cleaner's exclusive Quick features allows for easy access to its fan chamber. 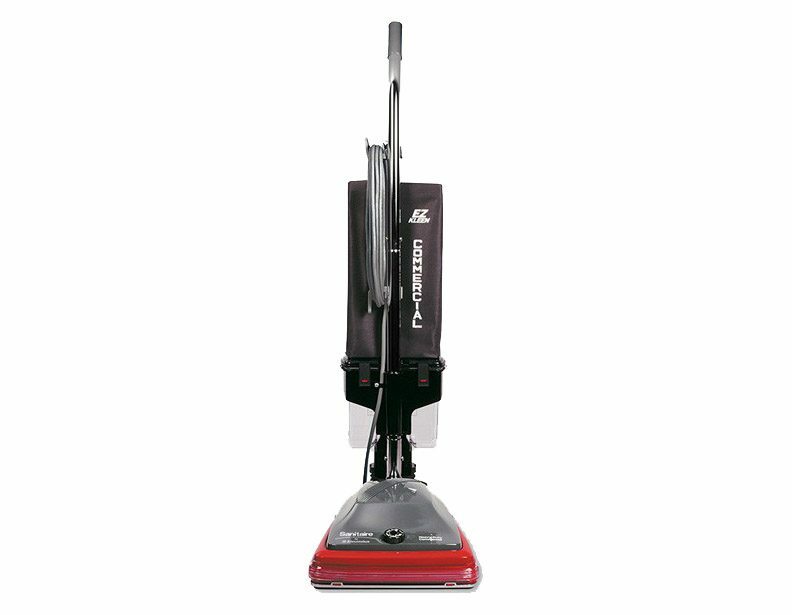 It offers a 12-inch cleaning path, six carpet height adjustment settings, a generous fifty-foot power cord, Vibra Groomer II chrome-steel brushroll, large wheels, and a durable chrome-steel hood. Its shake out dustbag will save you from the tedious cycle of buying and changing traditional dustbags. This vacuum cleaner offers many of the same great features as the SC886, but has a different dust containment system.This Sanitaire by Electrolux SC887 commercial upright's EZ-Kleen dustcup allows the user to tell at a glance when it needs to be emptied. This vacuum also features Sanitaire's exclusive Quick Kleen feature, which allows for easy access to the fan chamber. The SC887 also offers a Vibra Groomer II chrome-steel brushroll, fifty-foot power cord, chrome-steel hood, and six variable carpet height settings. 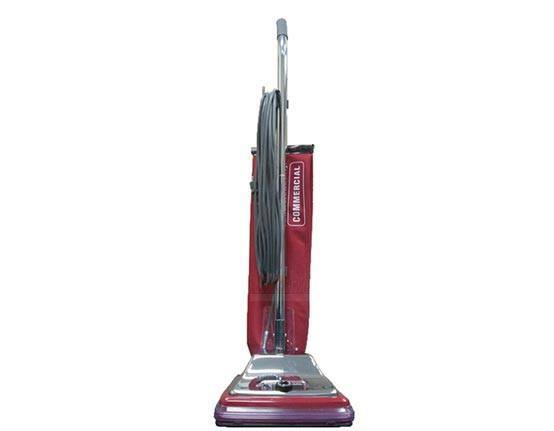 This commercial-grade Sanitaire by Electrolux SC888 upright vacuum offers many of the same great features as the SC886 and SC887, but utilizes allergen-trapping, disposable paper dustbags in place of a dustcup. This feature can add to the SC888's longevity and grant it consistent cleaning performance throughout its life. It includes the Vibra Groomer II chrome-steel-brushroll, a chrome-steel hood, large wheels, a generous fifty-foot power cord, and six adjustable height settings. The Sanitaire by Electrolux SC688 commercial upright vacuum cleaner is designed to tackle continuous cleaning on deep-pile carpets. Multiple height adjustments and a high-efficiency seven-amp motor grant the SC688 maximum cleaning performance on low-pile commercial carpeting, deep shag rugs, and everything carpet type in between. What's more, it utilizes high-efficiency filter bags to trap airborne allergens and other irritating particles. The SC688 is ideal for hotels, hospitals, restaurants, and homes. 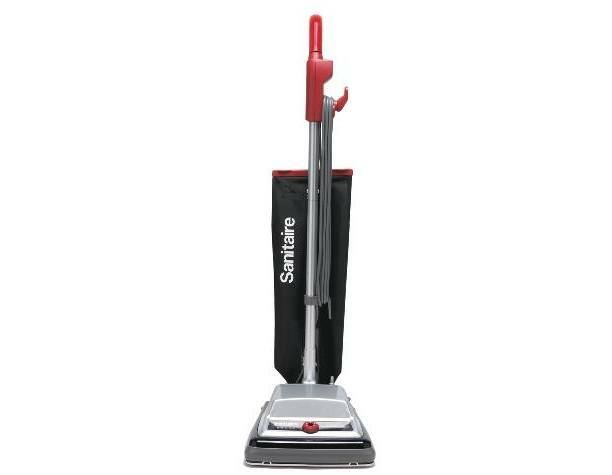 If you're looking for a vacuum that will help you cover more space in less time, look no further than this Sanitaire SC899 commercial upright vacuum cleaner. This model's 16-inch cleaning path grants you the power to clean more space in less time. Its fifty-foot power cord will also grant you the ability to clean a wider space without needing to change power outlets. 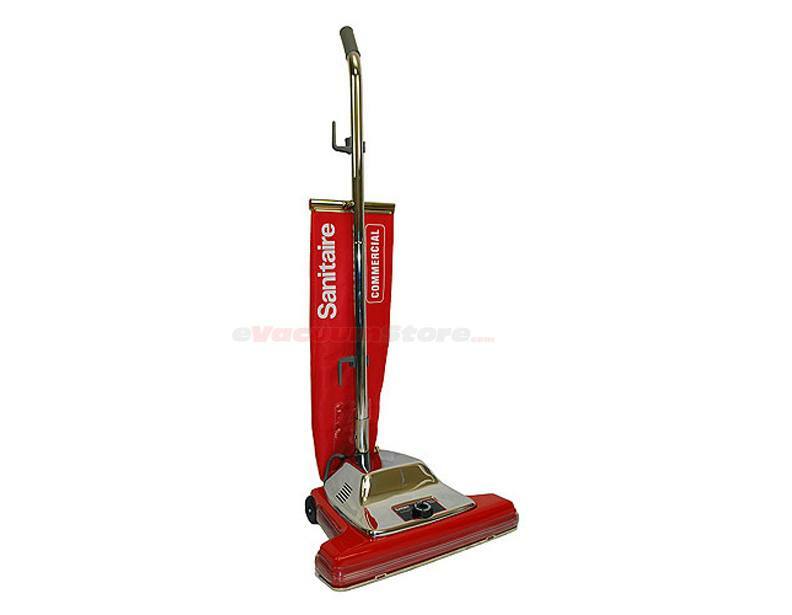 With this vacuum at your disposal, even large rooms will be cleaned quickly and efficiently. 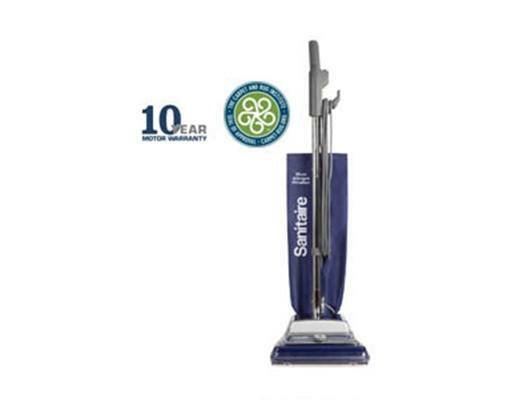 The lightweight Sanitaire by Electrolux SC9050B commercial vacuum carries the Carpet and Rug Institute's Seal of Approval for outstanding performance and efficiency. At just 10.7 pounds, it is one of the lightest commercial vacuum cleaners on the market. It is also one of the most maneuverable. The SC9050B comes with a thirty-foot power cord, a wide thirteen-inch cleaning path, and dual zipper dustbag. It is ideal for cleaning schools, hotels, hospitals, office buildings, and other commercial spaces. 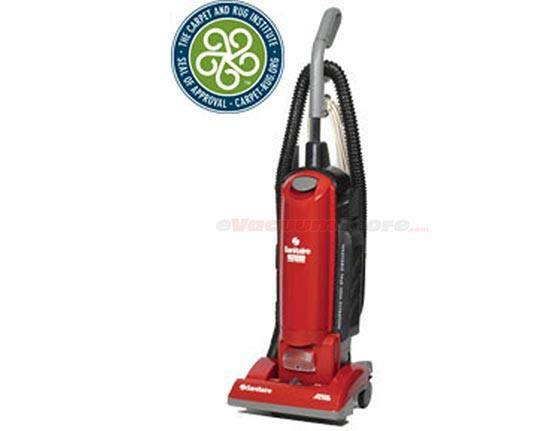 This Sanitaire by Electrolux SC785AT upright vacuum is one of the most compact commercial vacuum cleaners available. Its handle folds down from 45.5 inches to just 28.5 inches, allowing for easy storage in even the most cramped closets. 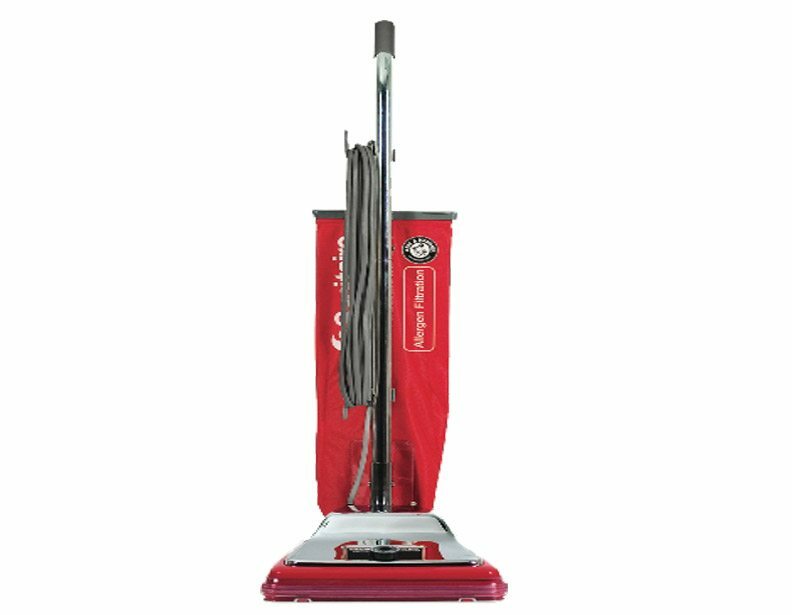 This commercial vacuum includes onboard attachments, a user-friendly suction hose, and a two-motor air bypass system. For unrivaled cleaning performance, convenience, and durability, check out the Sanitaire by Electrolux SC5713 commercial upright vacuum cleaner. This model includes washable HEPA filter that can capture airborne dust and allergen particles down to 0.3 microns in size. Its cleaning hose extends up to 10 feet for convenient cleaning on countertops, desks, and other above-the-floor surfaces. It carries the Carpet and Rug Institute's Seal of Approval and operates with a sound level of just 69 decibels. 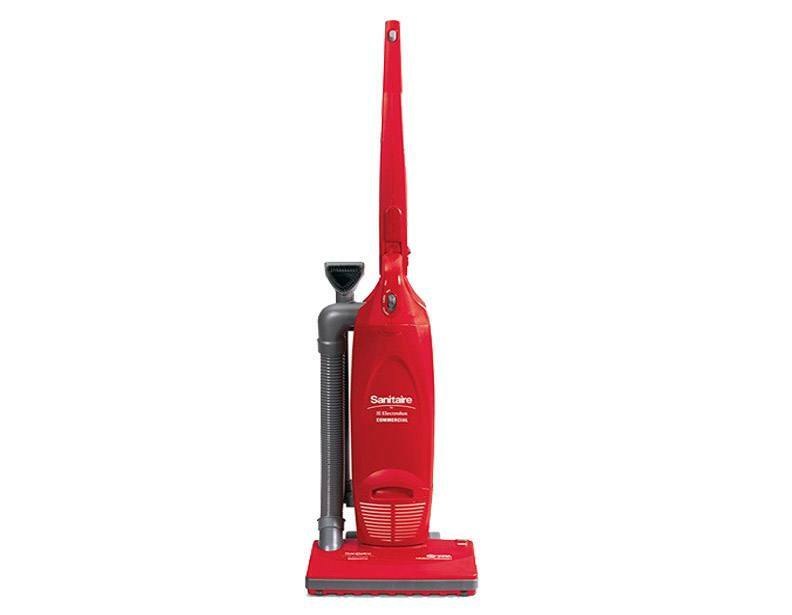 This versatile and lightweight Sanitaire SC882 bagless commercial vacuum cleaner is ideal for cleaning schools, government buildings, hotels, apartments, and more. Its fifty-foot power cord eliminates the need for frequent power outlet changes, and its large-capacity dustcup eliminates the need to buy or stock replacement dustbags. Among the SC882's other value-adding features are a powerful seven-amp motor, Quick Kleen fan chamber, and durable construction. The Sanitaire by Electrolux SC889A commercial upright vacuum cleaner is one of the most powerful two-motor upright vacuum cleaners on the market. Its 840 watt motor grants it the capability to clean up to 145 cubic feet per minute while maintaining a noise output level of just 69 decibels. The SC889 is LEED compliant and is recognized by the Carpet and Rug Institute as one of the most efficient and user-friendly vacuum cleaners available. This Sanitaire by Electrolux SC5845B bagless HEPA vacuum cleaner combines HEPA filtration technology with high-grade commercial vacuum performance. This vacuum will effectively capture airborne allergens while cleaning debris from the depths of your carpets. Although it is bagless, this vacuum cleaner is recognized as one of the best bagless vacuum cleaners available. 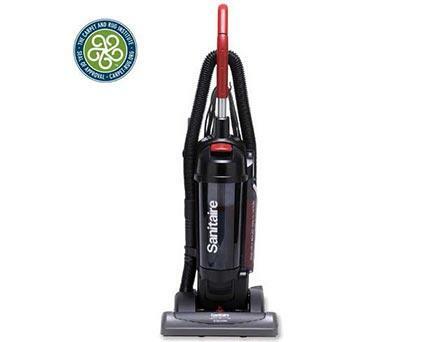 Both our review team and our customers are impressed by this Sanitaire by Electrolux SC9180B, and it's no wonder why. This commercial vacuum cleaner carries the Carpet and Rug Institute's Seal of Approval for efficient and powerful operation and is LEED compliant. It is exceptionally user-friendly and durable, and features a unique dial that directs airflow from its power nozzle to its telescoping cleaning wand. 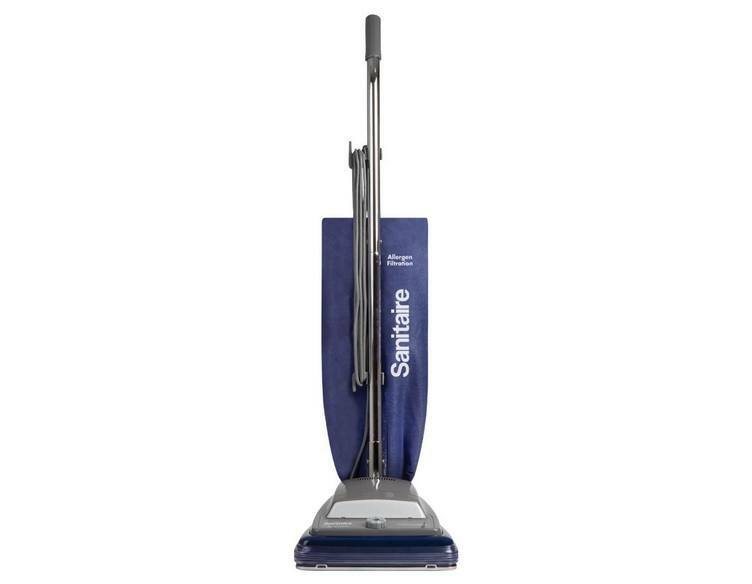 The Sanitaire by Electrolux S635 commercial vacuum cleaner offers superior mobility, lightweight construction, and a 30-foot power cord. Its allergen filtration system prevents dust and debris from seeping out of the dustbag once they have been trapped inside. This model uses disposable dustbags. 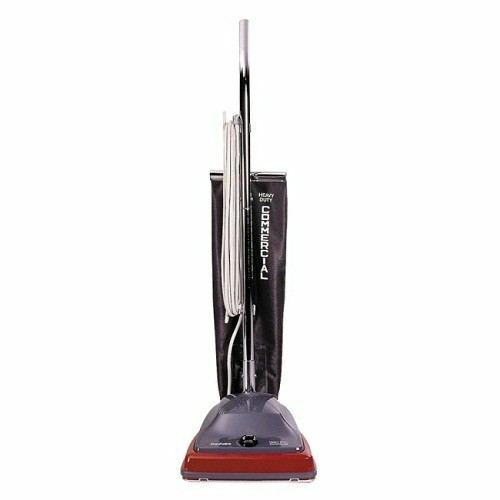 This Sanitaire by Electrolux S645 professional upright vacuum cleaner's powerful seven-amp motor makes it an ideal model for cleaning carpets in homes, schools, offices, and other spaces. A headlight on its power nozzle illuminates the dirt in your path to ensure that not a single spot gets missed. The S645 also offers effective allergen and particle filtration. This Sanitaire by Electrolux S675 professional upright vacuum cleaner carries the Carpet and Rug Institute's Seal of Approval, which is awarded to vacuum cleaners that pass the CRI's rigorous performance tests. 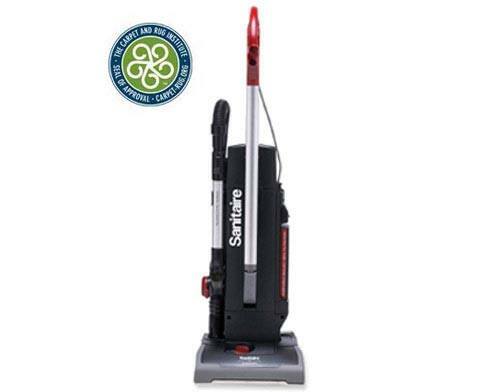 The S675 offers a 12-inch cleaning path, 35-foot power cord, and advanced micro-allergen filtration system. 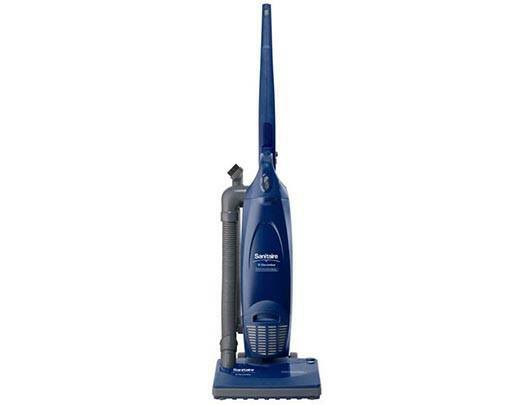 This compact and versatile Sanitaire by Electrolux S782 commercial vacuum cleaner features onboard tool storage, a five-foot extension hose, disposable dustbags, and an on/off brushroll switch. For easy storage, the S782B's handle folds down.